Her view stands in direct contrast to much of today’s fine dining world, where a 400 percent markup on a glass of wine is average; as is paying twenty dollars for a small appetizer, or twenty-five for a cocktail. As rents get steeper and restaurant culture gets more competitive, the already-expensive venture of dining out is only becoming pricier. Except, that is, in the curious case of Champagne. What was once a blinged out, ultra-exclusive affair has experienced an interesting second coming. Places like Air’s, The Riddler in San Francisco, Extra Brut in St. Louis, and Pops for Champagne in Chicago are casual and affordable, serving Champagnes and sparkling wines that you can drink every day, in bars that you can stroll into on any given evening. No longer. When Sara Verhey began overseeing her parents’ iconic Chicago bar, Pops for Champagne, she made it a point to rebrand the place to be more low-key. She moved the location downtown, added more affordable options, and dressed her waiters in T-shirts. “It was all part of creating that open, vibrant, airy atmosphere that would appeal to more people,” she says. Verhey, like her cross-country counterparts, serves a new generation of diners “interested in spending money on luxury, but not interested in the stuffiness associated with luxury,” like the tuxedos and the white tablecloths. These guests want to spend, but not blow their hard-earned cash. And more so than opulence, they are eager for innovation. “They want more unique offerings and new adventures that they haven’t tried,” says Whitney VinZant, owner of Extra Brut in St. Louis. 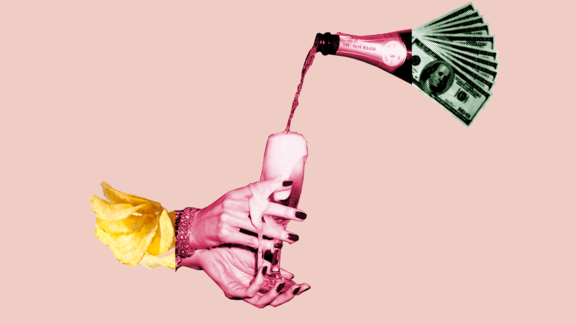 “You saw that with bourbon and the rise of craft beer, and now it’s happening in sparkling wine.” Instead of bottle service and crystal buckets, they want comfy chairs, cute, illustrated menus, no reservations, and lowbrow snacks. At Air’s, The Riddler, and Extra Brut, the food menu includes French fries, popcorn, and tater tots. The Riddler offers a chambong for drinking your wine, and a pour called The Joan, which goes all the way to the rim of the glass (named after a friend of a friend of owner Jen Pelka’s, who was a “floozy mom” — her words). Champagne’s reputation as a luxurious, exclusive product doesn't come from just anywhere. Real Champagne — sparkling wine made with grapes from the small Champagne region of France — is rare. “There is very little supply and very high demand, and there is a tremendous amount that goes into the viticulture,” Pelka says. “It is one of the most challenging wine growing regions.” That meticulous production method and limited supply, combined with clever, opulence-focused marketing on the part of large brands like Moët & Chandon or Dom Perignon, helped to establish it as the luxury beverage in America, meant only for special occasions and wealthy individuals. Meanwhile, in Europe, “Champagne is consumed as part of a typical weekday lunch,” says Whitney VinZant, owner of Extra Brut in St. Louis. The goal of these second-wave Champagne bars, then, is to provide an accessible entry point. Champagne for The People. That means offering a menu that includes not just champagne, but a global selection of sparkling wines — a category that has exploded over the past few years, thanks to higher demand by mainstream restaurants across the country. Champagne bars aren’t alone in their charge to make the high-end approachable. Just last year, alleged No. 1 restaurant in the world Eleven Madison Park opened Made Nice, a quick-service spot serving more casual versions of its signature fine dining offerings, like a confit pork bowl inspired by a suckling pig dish, or a milk and honey soft serve, which is a take on an ice cream and honey brittle-based dessert. Places like Sugarfish in Los Angeles and Sushi on Jones in New York take the high-end concept of omakase and bring it down to 30-dollar or 50-dollar price points, in a much more relaxed setting. What was once so exclusive is now readily available to the masses. Victoria Blamey brings Chumley's into the modern era.